The U.S. Team Racing Championship is raced in three-boat/six-person teams. 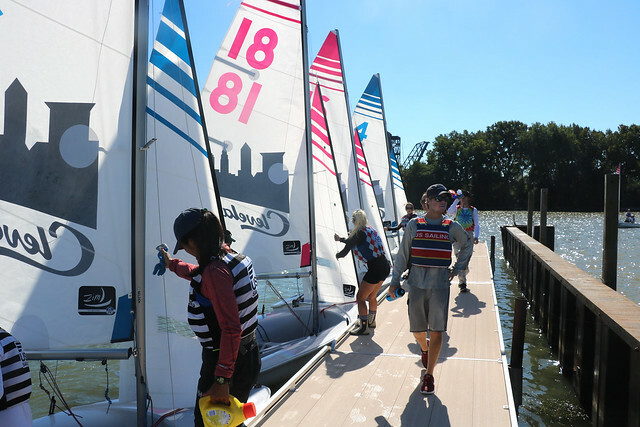 This event serves as a qualifier for World Sailing’s Team Racing Worlds when held. Doublehanded, monohull dinghies, exact make varies by year. V15, FJ, 420E, and z420 have all been used in past years. US Sailing’s first national team racing championship was held in 1981. The trophy was donated in recognition of George R. Hinman’s many years of service and contributions to yachting. He was a member of the crew that won the second championship for the Sears Cup, a top ranking sailor in the International One-Design Class and for many years in the forefront of Long Island Sound frostbite dinghy racing. He sailed many ocean races and took part in the America’s Cup in various capacities as helmsman, syndicate manager and chairman of the America’s Cup (selection) Committee. A former President of NAYRU (now US Sailing), he also was a Vice President of the International Yacht Racing Union (formally ISAF, now World Sailing).